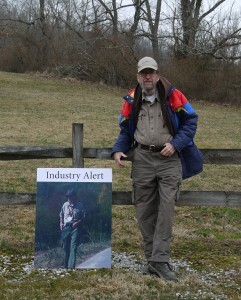 Bill Hughes with a poster about him that oil and gas lobbyists had at the WV State Capitol. Photo by VS.
Update: Brief obit now published here. With heavy hearts, the staff and board of OVEC extend our deepest condolences to the family of William Hughes, who died on March 25, 2019. Although we knew medical issues meant that Bill was growing weaker these past few months, the news still comes as a great shock. No doubt OVEC members who knew Bill and his work, along with scores of people whose lives he touched, are deeply saddened. Bill’s wife Marianne let us know: “He spent the last few weeks perusing all the cards of thoughts and prayers and well wishes from all the environmental community. These were his sustenance.” She extends her sincere thanks to everyone who sent those cards. “West Virginia has lost an amazing educator and activist and champion of the people. Bill dedicated his retirement years to learning all about fracking-related activities and then sharing his knowledge with his neighbors, regulators, scientists, students, filmmakers, journalists, and activists. Like so many people, I will sorely miss Bill and his sense of humor,” says Vivian Stockman, OVEC’s executive director. 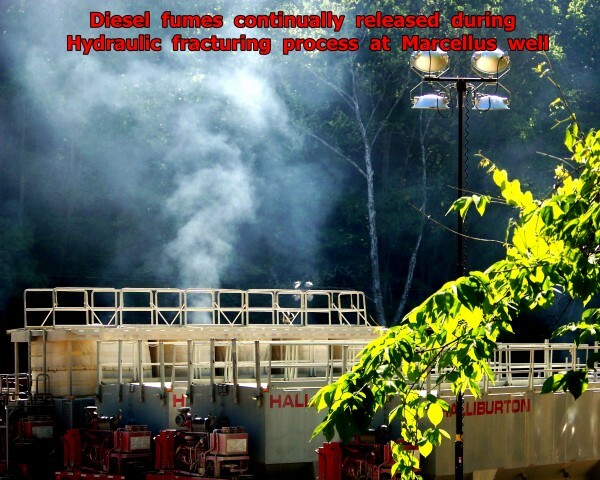 For about a decade, Bill documented the activities of shale gas operators near his home in Wetzel County, West Virginia. An influx of huge vehicles, driven by fellows who apparently had little knowledge of local winding country roads, first alerted him to the fracking invasion and moved him to action. Both Bill and his wife Marianne had grave concerns for the safety of their grandchildren and all children on those roads, once the fracking trucks started taking over. Bill’s documentation of the fracking invasion included deep research and benefited from his longtime role on the local solid waste authority. He was perhaps the first person to raise the alarm over the huge volumes of fracking-related radioactive waste coming into local landfills not designed for this type of waste. Bill presented his photos and PowerPoint essays at dozens of events. 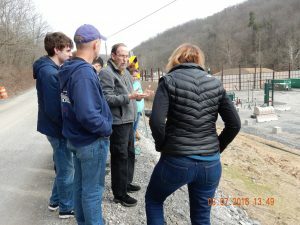 He hosted scores of ground tours to show firsthand, to anyone interested, assorted fracking-related activities and their impacts on local communities and the environment. He was also keen to show them the solar panels that powered his home. Bill has left copies of his thousands of photos to both OVEC and the FracTracker Alliance. Many of Bill’s photos and PowerPoints are already housed on OVEC’s website, ohvec.org. 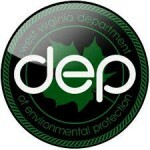 In 2016, the WV Department of Environmental Protection awarded Bill the agency’s Spirit of Environmental Protection Award. In 2018, OVEC awarded Bill its Laura Forman Passion for Justice Award, our highest honor. Bill’s extensive collection of photos and his powerful presentations will continue to educate people and underline the urgency for more widespread use of renewable energy . I am so sorry to hear of the loss of Bill Hughes. I considered Bill a friend and admired how hard he worked to help people know and understand more about sound solid waste management and all things oil and gas. He helped and supported me over the years and was one heck of a campaigner for Don McNaughton years ago. I will miss him. Bill’s passing is so sad, not only for the loss of such a tenacious eco trooper but for the fact that the world has lost a fine human being. I first met him (with his yellow car and yellow shirt) many years ago at Cedar Lakes. Within seconds, he made me laugh out loud. He generously taught at Sierra Club’s Marcellus Academy and always downplayed his part in the fight for justice and decency. He was one of the most decent people I’ve ever had the privilege of meeting. Happy trails, Bill. Bill’s contributions are immense, and his work and feisty spirit that called upon all to do what’s right by the people of Wetzel County, of all of West Virginia, carries on. From all of us at WV Rivers, we are deeply grateful for everything Bill Hughes embodied and gave in his commitment for clean water and a healthier, more just world. He will be sorely missed. Thank you OVEC for this perfect tribute to the one-of-a-kind Bill Hughes! Suzanne and I are so sorry to hear of Bill’s passing. He was a special person whose integrity and passion for justice made a difference in many lives. Our prayers for him and his family. Oh my, such a loss! So sorry to hear, Bill was such a treasure to the community! This is such a huge loss. Bill is one of the early responders to recognize the true dangers of fracking and its waste. We here in Ohio will never forget him. Somehow, during his own personal suffering, he was able to rise above that to tell the truth to protect communities. Bill will never be forgotten – and his Spirit lives on! We take Bill’s courage and perseverance with us as we continue to fight the good fight for justice and truth. We love you, Bill – God Speed! Bill was the first person to show me the devastating impact that shale fracking was having on our state and communities. He gave me and Rick a tour of Wetzel County and I remember Rick saying “and I thought coal was bad…” He was a wonderful person and activist and we will miss him. Bill was a champion for the cause. He went out on a limb all the time so his children could live in a state with clean water. He spent years of his life documenting bad business practices and educating the public in an effort to bring about change. He kept on working even when he didn’t feel well. Bill is an example for all of us who care about the future of our planet. I’ll never forget being at Bill and Marianne’s to prepare for a presentation. While looking at pictures to include, Bill casually mentioned the location in one of the photos was very near to where he once crashed his plane into the Ohio River. If you knew Bill, no doubt you are grateful and better for the opportunity. If you didn’t, you missed a rare and precious gem. Bill was a great story teller, fact checker and lover of these WV hills. A true and faithful servant to the mission he undertook to educate as many as would listen. Fly high and safe landing dear Bill. My condolences and thoughts are with Bill Hughes’ family and friends in WV. In the making of In the Hills and Hollows I had the privilege to spend countless hours with Bill at this home, driving around the rural countryside and walking through the forest as he educated me on the impacts of natural gas in his community. Bill and his wife Marianne Hughes became like second parents while I was working on the film, their support, and work towards advocating for their community I will always deeply admire and appreciate. May you rest in peace Bill and thank you for your work in the world. Bill was an hilarious and powerful life force fighting for environmental protection and justice for our planet and its people. His abstract sense of humor made his powerful advocacy even more powerful. Somewhere in the ethereal afterlife he is no doubt making sure that environment is safe and secure for all others who have crossed over before him. He shall be missed but not forgotten.